For yoga, Pilates, dance, martial arts, and all barefoot activities, half-toe ToeSox with the Toesox patented non-slip soles are the ultimate socks for sensitivity and grip . Exposing the toes provides important additional grip and sensation, while the individually separated toe design allows them to spread naturally, promoting overall foot health. 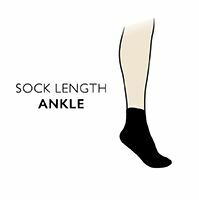 ToeSox Half Toe Organic Cotton Ankle Yoga Socks are woven in 90% organic cotton rich yarn, with inbuilt arch support bands and secure fitted heels. If your activity relies on foot feel, you need these fabulous socks!